“With biking to work already on the rise in large U.S. cities, we strongly believe that the moment is now to accelerate this trend and fundamentally transform urban transportation by making riding a bike effortless, smooth and smart — basically, by finally making it a truly attractive alternative to driving a car. This is the promise of our FlyKly Smart Wheel,” said Niko Klansek, founder and CEO of FlyKly, Inc.
New York-based FlyKly debuted its prototype wheel a year ago in a successful crowdfunding campaign on Kickstarter. To take the wheel to the next level, the FlyKly team ventured to Italy—a country well known for producing beautiful, high performance bikes—to partner with a team of designers, engineers and software developers from the prestigious Polytechnic University of Milan. Today, the Italian-designed FlyKly Smart Wheel is significantly smaller and lighter than its original design and offers a smoother ride while enabling cyclists to travel up to 60 miles on a single charge, depending upon how much of a boost they need or want from the motor. The FlyKly wheel and riding experience are controlled and customizable through the companion FlyKly App (iOS and Android), which works on smartphones and other devices using Bluetooth 2.3. The FlyKly Smart Wheel comes in three rim sizes — 20,” 26” and 28” — to fit practically any bike and enable cyclists to easily transform their own bikes into pedal-assisted electric bikes. It takes fewer than five minutes to mount the fully assembled wheel. The sturdy, weatherproof casing for the all-in-one motor at the wheel’s hub comes in two subtle colors—either pure white or silver gray—and is only seven inches in diameter. Bikes sporting the FlyKly Wheel do not look at all like traditional electric bikes, which are generally larger and heavier. The expression “it’s as easy as riding a bike” still applies when riding a bicycle enhanced with the FlyKly Smart Wheel. After initially pairing the wheel with the FlyKly App, the rider can customize and change their riding experience whenever they wish, setting variables such as how much of a boost they want from the motor — ranging from none at all to 100% — or the maximum speed they want to go, up to a top speed of 16 miles per hour. After that, the rider simply hops on the bike and starts pedaling per usual. In response to the rider’s settings, sensors in the wheel tell the motor when and how much to kick in to give the rider the boost they want. The 250W motor shuts off when the rider stops pedaling, and FlyKly Wheel’s regenerative braking system then kicks in to slow the bike and simultaneously recharge the battery. In addition to coasting downhill with the motor off, pedaling backwards also charges the battery, making it possible to go even farther on a single charge. With a 100%-assist from the motor, a rider can go up to 30 miles on a single charge, and much farther if they require less assistance or add to the charge while coasting downhill or pedaling backwards. It takes 2-3 hours to fully charge FlyKly Wheel’s 30 Volt lithium battery using an electric wall charger, which comes with the wheel. 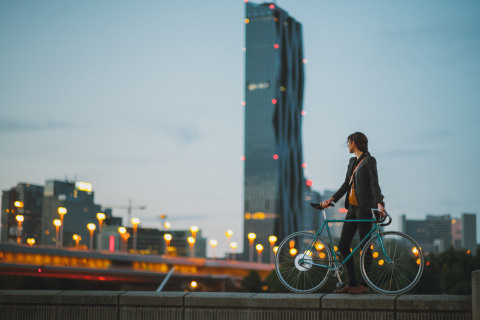 In addition to being able to customize their riding experience through the FlyKly App, cyclists can also use the app to track their riding speed, their distance traveled and trip duration. With data gathered by the FlyKly Wheel sensors, which measure motion, torque and heat, and leveraging the wheel’s onboard GPS, the app will soon be able to make route recommendations based upon the rider’s stated preferences and actual riding style. Cyclists will also be able to share any of this information with other cyclists, and offer it to city officials to help with plans to make their cities more bike- and environmentally friendly. 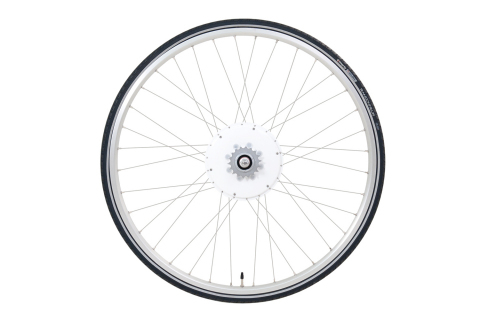 Now available, the FlyKly Smart Wheel comes in rim sizes 20”, 26” or 28” and may be purchased for $1,099 on the company’s website at http://flykly.com. The companion FlyKly App is available for free in the iTunes App Store (iOS) and in the Google Play Store (Android). FlyKly, Inc. designs and manufactures smart tools for smart urban transportation. Its flagship product is the FlyKly Smart Wheel, which turns ordinary bicycles into pedal-assisted electric bikes. The Italian-designed and manufactured FlyKly Smart Wheel, which has earned three international patents, started shipping to Kickstarter backers in December 2014 and announced its general availability in January 2015, making it the first smart wheel for bikes to hit the market. The company was founded in 2010 by Niko Klansek and is headquartered in New York, New York. More information is available at http://flykly.com. The FlyKly media kit is available at bit.ly/flyklypk. FlyKly, Inc. is exhibiting at CES 2015 at Eureka Park booth #75204; on-site contacts may be reached at 510-384-0845 and 917-683-7725. The FlyKly Smart Wheel, which turns an ordinary bicycle into a pedal-assisted electric bike, is announcing its general availability and new design.